I have planned for some time to make a wall display using silver platters and bowls. I saw a few collages on Pinterest. I pinned them to my "wall decor" board for future reference. 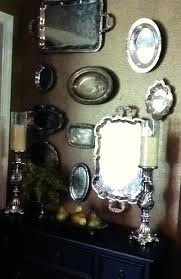 Then I started collecting my own silver pieces from thrift shops and resale stores. I played around with the arrangement a bit. I also measured the space I wanted to cover on the wall and made sure I had enough pieces to fill that space in the best way. Next came the job of polishing the pieces. I had gotten a tip from one of the volunteers at a charity resale shop. She told me the only thing to use is Simichrome Polish. She was right. The piece on the right looked worse than the one on the left. 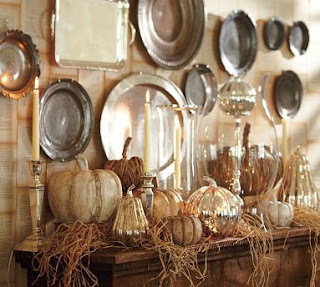 What looks like tarnish is actually the reflection of the chandelier hanging above the table. Some of the pieces had a few marks that were not coming out with any kind of polish but that is part of the upcycling charm. This was the chosen location for the collage. Now I just had to figure out how to hang them. I bought a wide strip of Velcro at Hobby Lobby and also some Command Strips from Lowe's. The Command strips were made to hold 16 lbs. so I used those for the really heavy pieces and Velcro for the rest. I started at the bottom and hung a vertical row directly up the center of my designated space. I did use a level and marked a few spots to keep from veering off center. I also marked center on the trays to help me follow the line up the wall. That all went well. I left it overnight to test the adhesive before I continued. I wanted to branch out on the sides of this center line but eyeballing that part was really the best way to go. I currently have not mastered bilocating so I wasn't able to stand back and press them in place at the same time. So, again, I called on my brother for help. He held them in place and I called out the directions. I think we did a splendid job. The tray on the bottom left has a rim on the back that holds it away from the wall so my brother drilled a little hole in the rim, attached a piece of wire and hung it with a picture hook. The next step was to accessorize the buffet top. Because I also had a small stash of silver teapots and pitchers I thought they would create a continuous line from vertical to horizontal surfaces. I didn't photo document the process so the following are all "after" shots. I wanted a little pink accent on this side of the room and this is it. By the way, that is my houndstooth rug reflecting in the base of the pitcher and that red column next to it?....yea, that would be my reflection. The flowers seemed like just the thing to draw out the pinkish color in the drawers of the buffet. I feel obligated to full disclosure regarding my tray display. After a couple of days four pieces have popped loose and fallen off the wall. They were not the heaviest pieces so I ruled that out as probable cause. They have all been the ones attached with Velcro so I am now attaching one side of the Velcro to the wall and letting that set for awhile before I attach the silver. So far so good. None have fallen in the middle of the night either, so for that I'm grateful. It's so nice to finally pull into play some of the items I have been collecting. That takes care of the west wall. 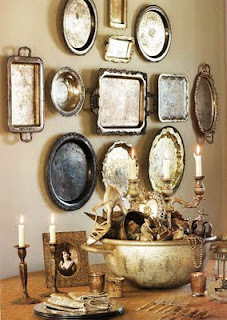 My next post will show the east wall which also includes a little reflective silver. I'm hoping these don't tarnish quickly. Polishing silver is only fun for the first couple pieces. Nice job. This looks great! They will probably tarnish at different times so you won't have to do them all at once again. Just do a couple and wait a few weeks and do a couple more. It won't be too bad! Tricia, that looks amazing. Love all the silver. It's a great compliment to the chest. This post really caught my eye- beautifully done! Very creative. Love it.